The Kinesthetic Sense is needed for almost every task. Read on for more information on kinesthetic learning, exactly what is kinesthesia, how the kinesthetic sense plays a part in fine motor skills, and kinesthetic fine motor activities that can help with motor planning and learning through play. The Kinesthetic sense is a huge part of every action we do. When we pick up a toothbrush and brush our teeth, we "know" the motion and amount of pressure that is needed to move the toothbrush and polish teeth without poking the side of mouth with the toothbrush. The Kinesthetic sense allows us to zipper a jacket without looking at the zipper. It allows us to tie our shoes while looking up at a friend on the playground. It allows us to have a conversation and look around at our table mates while using a fork, wiping our mouth, and picking up a cup during dinner. It enables a student to flip the pencil and erase a mistake without looking at the pencil and thinking through each step of moving the pencil within the hand. Kinesthesia allows us to participate in actions with motor planning, appropriate motor actions, and effective proprioception. Praxis, or kinesthesis help us understand how to move our bodies. The praxic system is also known as the kinesthetic system. The kinesthetic system essentially “puts it all together” when it comes to motor responses to sensory information that has been perceived by the other senses. Knowing how to move our body and how those actions are to be performed is a big part of sensory processing, including a combination of many senses! Read more about sensory processing and how all of the senses are part of a big puzzle in our recent book, The Sensory Lifestyle Handbook. All of this processing movements and knowing how to move the body within an action make up kinesthetic learning. Kinesthetic learners need to move their bodies, manipulate materials, and really interact with learning materials. These children tend to fidget, wiggle, slouch, or get up out of their seats when in the classroom setting. 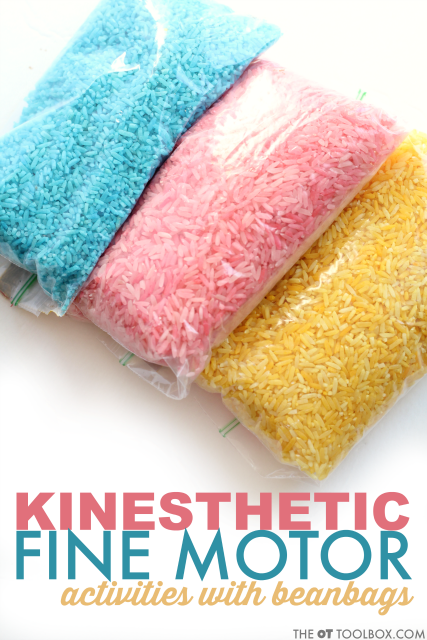 This site has a lot of great information on kinesthetic learning. Adding movement opportunities involving multiple senses into learning opportunities benefit the kinesthetic learner. Kinesthetic learning has also been called three dimensional learning. Kinesthetic learning occurs during learning experiences where a student feels, touches, hears, moves, and overall "experiences" in learning. Having a motor plan for an action can help with tasks that are performed again and again. This is true for the motion needed to open and close scissors while using both hands in a coordinated manner. Motor planning is necessary for formation of letters and numbers (Consider being able to jot down notes very quickly or writing a quick fill-in-the-blank word when looking up at a Smartboard.) Motor planning allows us to manage clothing fasteners without looking. This is the “muscle memory” that allows movements to be performed in a smooth and coordinated manner. Addressing the kinesthetic sense in learning can be helpful for many children, particularly those who are kinesthetic learners. Linked to motor planning and kinesthetic motions is proprioception. The ability for muscles and joints to manage weight and position in space are necessary for movements to occur with appropriate force modulation. The Proprioception Sensory System is the recognition and response to the body’s position in space with an internal feedback system using the position in space of the joints, tendons, and muscles. This sensory system allows the body to automatically react to changes in force and pressure given body movements and object manipulation. The body receives more feedback from active muscles rather than passive muscle use. Related to the proprioceptive system is kinesthetic motor actions, or praxis. Individuals are able to plan and execute motor tasks given feedback from the proprioceptive system. Praxis allows us to utilize sensory input from the senses and to coordinate hat information to move appropriately. Kinesthetic actions occur in both gross and fine motormovements. When a child is able to complete jumping jacks with coordinated upper and lower body movements they are utilizing gross motor kinesthetic movements. These outdoor kinesthetic learning activities can be as fun as they are helpful for kids! 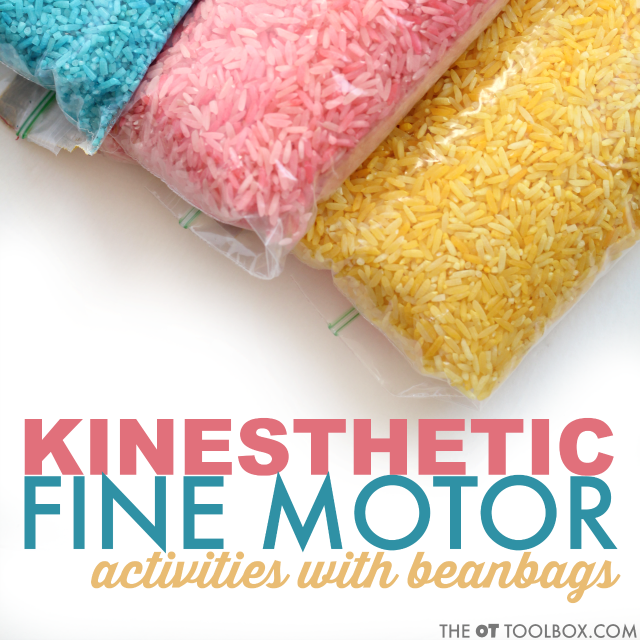 There are ways to develop and strengthen kinesthetic fine motor actions. These activities can be used to help develop muscle memory, motor planning, and the ability to recognize and respond to various levels of weight and kinesthetic input. One way to develop kinesthetic fine motor skills is to use weighted bean bags in various weights. 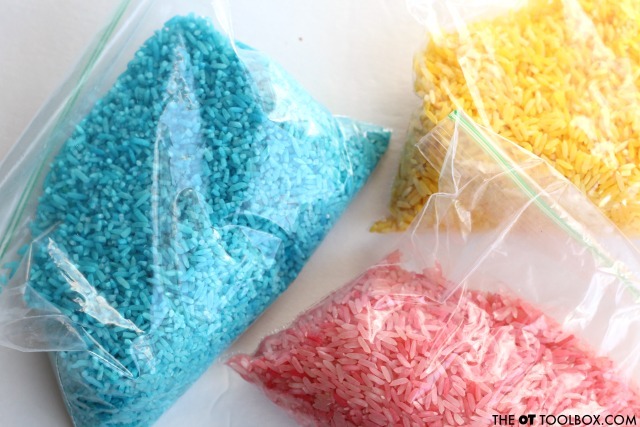 These simple DIY bean bags use brightly colored sand in see-through plastic baggies. Different styles of DIY bean bags can be used to provide more a more lasting bean bag. 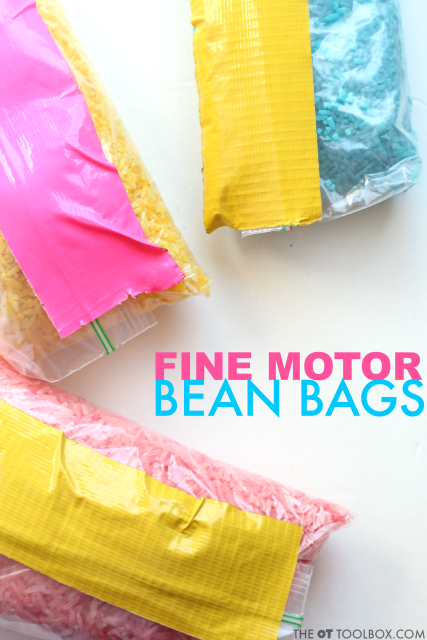 Use colored duct tape to secure the bean bags. Students can then use the weighted bean bags to practice and develop kinesthetic fine motor skills. Weighted bean bags may be sized appropriately to fit the child’s hand to address arch development and closure of the hands. The weighted objects can be dropped from one hand and caught with the other supinated hand. Trial this activity in various positions and distances. Then, switch hands so the non-dominant hand is dropping the bean bag and the dominant hand catches the bean bag. Have the child close their eyes and drop the bean bag from one hand to the other. This encourages and challenges the kinesthetic sense without input from the visual sense. More practice with the eyes open will make this exercise easier as the child's muscle memory is built. Various weights and sizes of objects should be trialed in the various positions and distances. Try this activity while sitting and standing. There is more input from heavier objects and less input from lighter weight objects. 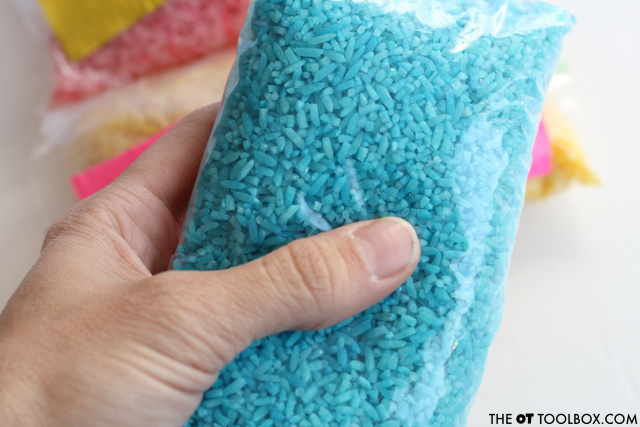 Be sure to limit throwing of these bean bags, unless you enjoy sweeping up lots of dyed rice! Other weighted objects can be used for this activity too, including marbles, small balls, stress balls, etc.